The Ebricks.com Towel Warmers guide offers information about companies such as Runtal North America and Fixtures Etc. Maker and direct seller of upper-end bathroom showers, faucets, shower towers and towel warmers. This UK company ships worldwide and quotes prices in U.S. dollars. 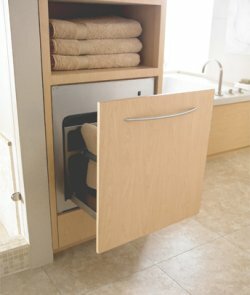 Drawer warms and stores towels.